Any text-type in MusiCAD has a few characteristics that you may alter to suit your needs. 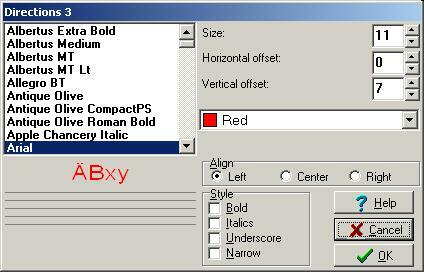 Specify font, color, size, style, horizontal and vertical offset for a text type in the text details dialog. The text details dialog can be accessed from the header and footer dialog, text dialog and the layout varia dialog by using the button beneath the corresponding text. Setting a text's size to zero will hide all corresponding texts it for display without the need to remove them from the music.